Increasing immersion with controllers meant to evoke the activity being depicted in a videogame is a venerable tradition. Flight sticks and control yokes to simulate piloting a plane, steering wheels to mimic the experience of driving a race car, the $200 Steel Battalion controller that so brilliantly conveyed how ludicrously expensive and impractical waging war with mecha would actually be - the list goes on and on. Whatever their differences, most successful examples of the genre have one thing in common: They are not giant balloons. In 1988, Japanese publisher Varie released a motorcycle racing game called Top-Rider for the Famicom. 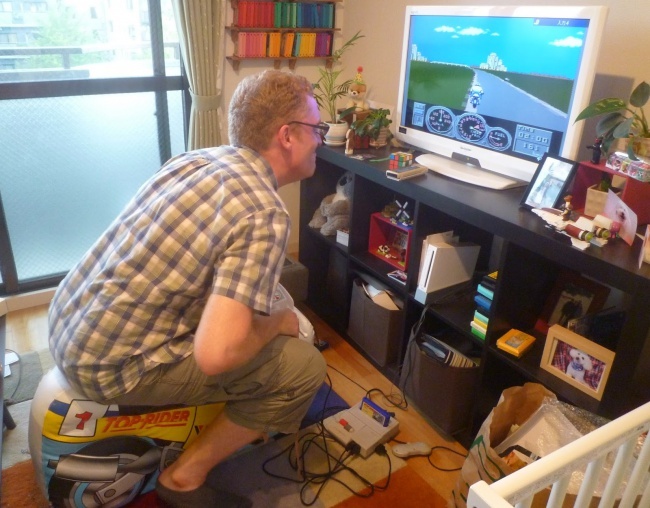 It came packaged not only with a special handlebar-shaped controller, but an entire inflatable motorbike it connected to that the player was meant to sit on during the game. The developers were apparently very dedicated to their vision of creating the ultimate immersive experience, since the game won't even work with a normal controller unless you enter a special cheat code on it first. It's an interesting illustration of how video games were viewed in that era, as basically just another type of children's toy. The Top-Rider motorcycle is built for the proportions and weight of a small child and will come to a quick and catastrophic end if subjected to the full weight of an adult. It's not merely designed to appeal to kids rather than adults - the core selling point of the entire game is simply unusable by most postpubescent gamers.